In the past few years I attended numerous food fortification meetings in dozens of countries. The clear health benefits and cost-effectiveness of this intervention to improve public health are never disputed. However the implementation of food fortification is frequently delayed and complicated by fairly difficult questions about how to monitor and control the process as well as its effectiveness. A number of manuals have been issued on how to monitor food fortification* (e.g., WHO, ECSA). A few also cover how the fortified samples should be tested listing different analytical methods. Still, there is no clear data on how reliable these specific methods are when testing fortified foods, how accurate the results coming out of various national laboratories are and how to interpret these results to make the right decision. Obtaining such data is no easy endeavor. Measuring levels of vitamins and minerals in food is a complex task of understanding if the levels and variation in levels are acceptable. 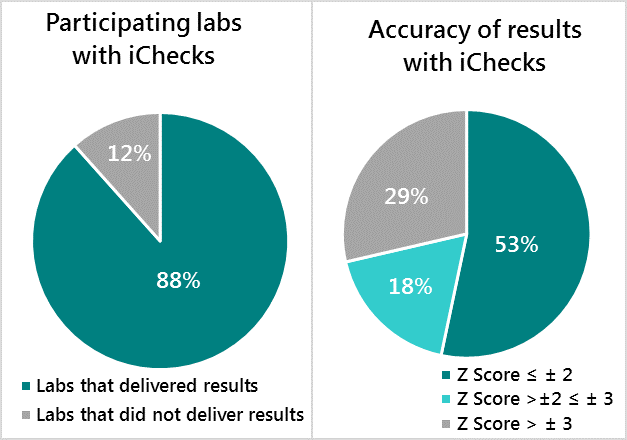 It is a different approach than food safety testing, where results are usually either YES (present) or NO (none detected). The proficiency testing schemes, which are designed to generate this data, are quite expensive and not easily executed in developing countries. Luckily Dr. Philip Randall, a senior technical expert in food quality and safety, did take on this endeavor in 2016-2017. He designed, executed and evaluated a first-of-its-kind study to assess the capability of national laboratories to test fortified foods and the accuracy of their results compared to select accredited reference laboratories. The capacity of laboratories to measure fortified foods was assessed by how many signed in to participate in the study compared to how many managed to deliver the results in time. The accuracy of the results was assessed by calculating measurement uncertainty. 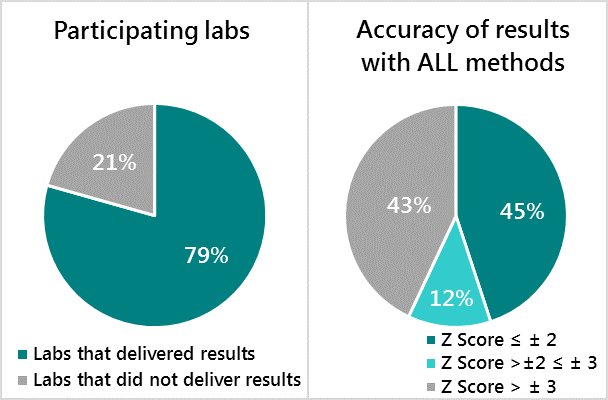 The reference values for accuracy were generated by reference laboratories with extensive international accreditation status. The samples used in this study included key staple foods such as wheat and maize flours, sugar**, edible oil and table salt. The micronutrients measured were vitamin A in oil, iodine in salt, vitamin A in sugar and iron with vitamin A in wheat and maize flours. The samples mentioned above were not available as Certified Reference Material and had to be prepared specifically for this study. The food vehicles (flour, salt, sugar, oil) were combined with micronutrient premixes containing specific amounts of vitamin A, iron or iodine, homogenized, aliquoted and sent out to all laboratories that signed up for the study. Laboratories were instructed to apply all available and functional testing methods. Table 1: Overview of food vehicles, analyzed micronutrients and their concentration and analysis results by the participating labs. 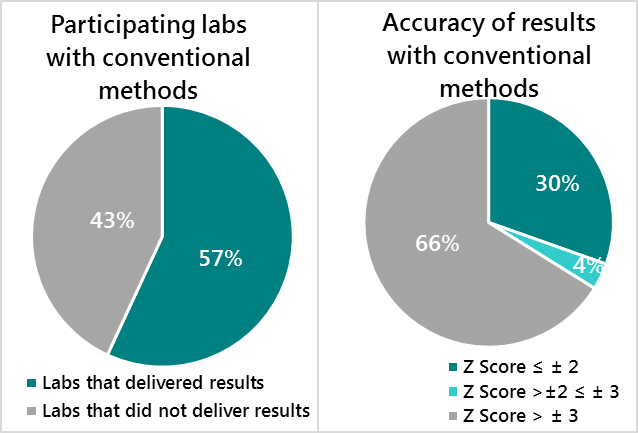 The results of each laboratory were communicated confidentially back to each lab, while the aggregated results have been put into a report and are in the process of being published. Action has already been triggered by the key findings of this study, with GAIN and ECSA making plans regarding analytical methodology and proficiency schemes. Significant planning as well as budget allocation would also be required by the individual labs to improve their capacity. This study provides important input to facilitate urgently needed realistic monitoring guidelines for fortified foods and improve overall clarity and compliance within food fortification programs. If you want to more information about this study you are welcome to contact the lead investigator Dr. Philip Randall at p3away@mweb.co.za. This study is supported by Global Alliance of Improved Nutrition (GAIN) and funded by The Government of The Netherlands. Acknowledgements: David Morgan (GAIN), Gerhard Rimkus (Intertek Food Services) and Phillip Makhumula (fortification consultant) all contributed to the experimental design and revision of the study report. 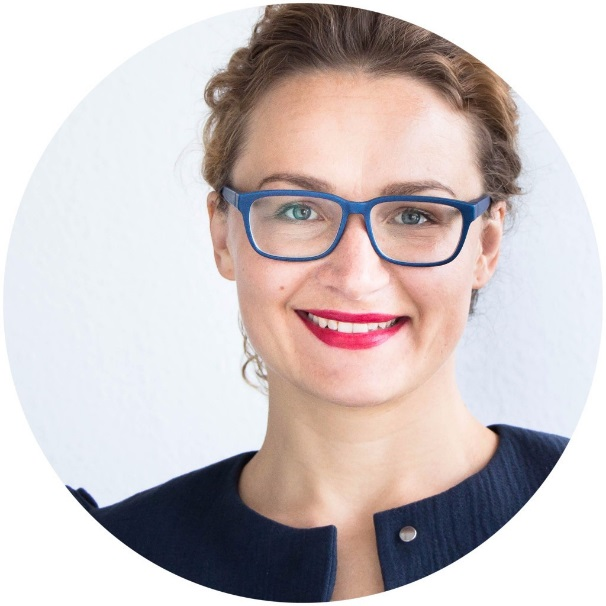 ABOUT THE AUTHOR Dr. Anna Zhenchuk is the Managing Director at BioAnalyt, where she has overseen new product development and provided hands-on support to customers in over 30 countries. Her background is in biotechnology, immunology and nutrition as well as business administration.